The Vanity Fair Digital Edition iPhone, iPod Touch, and iPad app uses straightforward navigation and interface to access its insightful articles, striking photography, and elegant perspective. You can download a 30 day free trial, but the subscription costs of $1.99 per month or $19.99 per year for the rich content and experience are reasonable. The Vanity Fair iPad app resides in your iOS Newstand. You simply touch the Newstand icon, then touch the Vanity Fair iPad app. As a new subscriber, I simply authorized a payment with my iTunes account in a pop-up notification screen. I also established a password-protected account with VanityFair.com to access subscriber features. The Vanity Fair iPad app has a functional home screen with simple navigation tools. The cover of each issue is a thumbnail image, and you press the cloud icon to download it. The download speed on my wi-fi connection was surprisingly swift. At the bottom of the screen, you move with one touch between the library, store, account, and faq screens. The navigation incorporates multiple gesture controls for an engaging, lively experience. You can simply swipe through each page to move through the magazine. If you run across a headline for an article on the front of the issue or table of contents, you tap it to move directly to that piece. You can tap the screen near the bottom, and a volume style adjustment appears. You can move from the beginning to the end of the issue with your finger swipe. If you tap at the top of the screen, you may select the list icon in the upper left corner. A list of content slides on the screen with a small image and title. You can touch the preferred content to move to it swiftly. You will also find a vertical line icon when you tap at the top of the screen in the right corner. This opens my preferred mode of navigation. A bar describing each piece of content emerges at the top of the screen, and the content shrinks to thumbnail sizes. You swipe horizontally, tap the content, and enjoy. 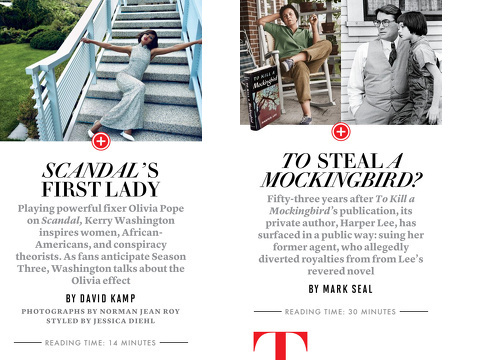 Additional helpful features emerge, as you dig into an issue of Vanity Fair magazine. You can add articles to your favorites with a touch on the star icon. The arrow icon allows you to move one step back. You can also share to Facebook, Twitter, and email seamlessly. The Vanity Fair Digital Edition iPhone and iPad app brings sophisticated and intelligent vibe, content, and stories to your fingertips with grace and ease. 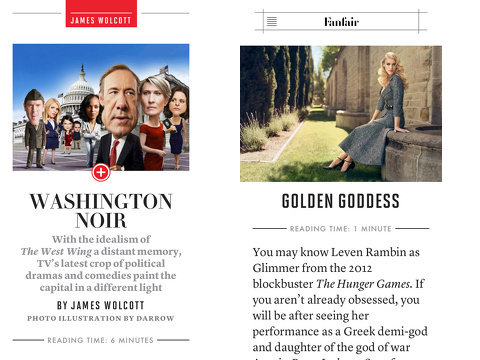 AppSafari review of Vanity Fair Digital Edition was written by Jenni Ward on July 31st, 2013 and categorized under App Store, iPad apps, News, Universal. Page viewed 6410 times, 1 so far today. Need help on using these apps? Please read the Help Page. Very good. Several features in an application. The advantages placed in its review, the application itself already paid the amount invested is low. Worth the experience. As investment is low aplicatito already paid. Congratulations keep posting these fantastic items, thanks! Great information and app. Another nice tool to help us. Very good and useful post, thanks for sharing it. Very nice app. Thanks for sharing this with us! great app, I love it, just have some details but this great advise !! !